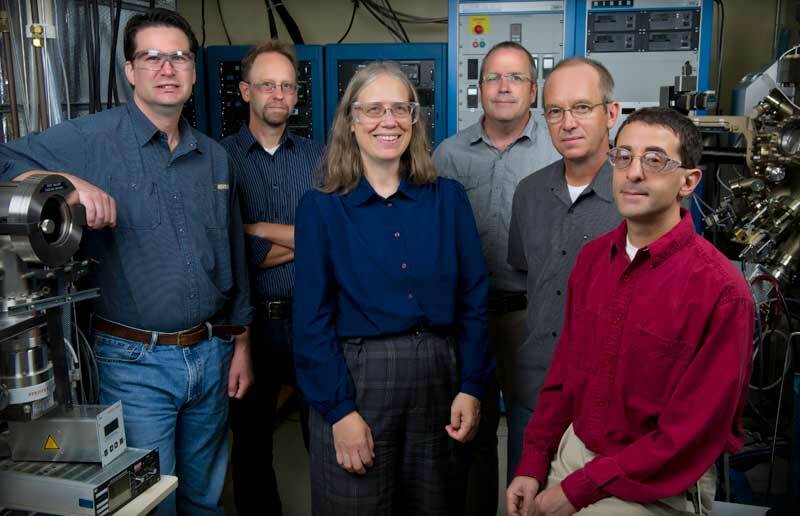 SJ3 multijunction solar cell Team include Aaron Ptak, John Geisz, Sarah Kurtz, Brian Keyes, Bob Reedy, and Daniel Friedman; un pictured team members are Jerry Olson and Steve Johnston. The Team also shared the 2012 R&D 100 award for their SJ3 Cell. 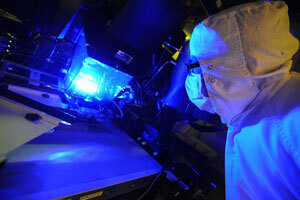 How to increase the Solar Cell efficiency? This is the biggest Question which the Solar Industry is currently facing. It is difficult to outsmart the solar spectrum, which has harsh boundaries and immutable rules. But Scientists at the start up Company Solar Junction, which is funded by NREL has come up with "SJ3 cell", which achieved 44% efficiency under concentrated sunlight of 947 Suns, which makes it Ideal for Utility Scale Concentrated Photovoltaic Projects. SJ3 Cell is a multi junction solar cell, which utilizes three layers of materials in the cells and these materials create multiple junctions with each having different band gap energies. The Solar Junction Scientists came up with the idea of three layered materials so as to absorb the Maximum number of Photons. Sunlight consists of Photons of a wide range of energies starting from almost zero to 4eV (Electron Volts). The Solar Cells with single photovoltaic junction have a single characteristic band gap energy and this leads to absorption of photons that very nearly match the band gap of the semiconductors in the cell. Higher-energy photons lose their excess energy as heat and low energy photons are completely rejected leading to complete energy loss. And hence Researches came up with Multi junction Solar Cells, which eliminates this issue to some extent. The Researches call this Multijunction as "III-V Multijunction", as they used materials from the third and fifth columns of the periodic table as they have similar crystal structures and ideal diffusion, absorption, and mobility properties for solar cells. But they still faced issues as it is difficult to capture the benefits of the gallium arsenide material while matching the lattice of the layer below and no known III-V material compatible with gallium arsenide growth had both the desired 1-eV band gap and the lattice-constant match to gallium arsenide. In 2001 NREL Scientists had discovered a three-junction commercial cell based on GaInP/GaAs/Ge. The Scientists replaced the 0.67-eV third junction with gallium arsenide diluted with nitrogen which helped them overcome this issue. They used a technique called molecular beam epitaxy, which helped them minimize impurities in the material rather than metalorganic vapor-phase epitaxy, which is the common Solar Cell Growth Technique. The molecular beam epitaxy (MBE) was done in ultra-high vacuum ie, minus 10 to the minus 13 atmospheres in order to lower the impurities to the point where an electric field can be created in the resulting photovoltaic junction. SJ3 is an instant plug-in replacement for the standard cell now used by the space and CPV industries and this 44%-efficient cell would instantly increase the entire system power output by close to 10%. Eliminates the germanium layer, which constitutes about 90% of the weight of the cell.